Matty Pearson's first goal for the club gave Luton a battling and hard-fought point against League One giants Sunderland at Kenilworth Road this afternoon. With 23 minutes to go and Town trailing 1-0, the summer signing from Barnsley showed real commitment to win the ball at the far post from Alan Sheehan's corner and then a striker's instinct to divert his effort inside the far corner with the outside of his right foot. It was no more than the Hatters deserved for their endeavours in the second period as they reacted well to conceding a goal on the stroke of half time to grab a share of the spoils and get their campaign up and running. Town boss Nathan Jones made two changes to the team who went down 1-0 at Portsmouth, Danny Hylton free from suspension to replace Harry Cornick, while Jack Stacey was preferred to James Justin at right back. Apart from Alan McCormack's ambitious volley flying well over, the hosts failed to really create anything of note in the opening exchanges. Neither did Sunderland to be fair though, although they had calls for a penalty when George Honeyman was dragged down, Glen Loovens glancing a header off target too. You could tell the visitors, relegated from the Championship last term, were a class above anything Luton had to face in League Two, but Jones' side more than matched their opponents during the opening half hour, as both sides cancelled each other out. However, the Black Cats were a whisker away on the half hour, Lynden Gooch eventually manufacturing a shooting opportunity on his left foot, dragging inches wide from the edge of the box. From that moment on, Sunderland's little bit extra started to show, as they appeared to have more time on the ball, nullifying Luton's threats and looking dangerous themselves, moving ahead on the stroke of half time. Gooch was heavily involved once more, as he cut in from the right and fed Josh Maja, who took a touch and then faced with Stech, confidently found the bottom corner. After the break, the visitors were close to a second, Bryan Oviedo's cross just above the unmarked Chris Maguire. Town upped the ante though, Lee's touch letting him down at the wrong moment, Pelly-Ruddock Mpanzu's effort blocked and then Dan Potts' low drive deflected behind for a corner, with the majority of the 10,000 inside the ground starting believe a fight back was on. Pearson showed real bravery to meet another Sheehan set-piece ahead of keeper Jon McLauglin, but his header flew into the home fans. Sunderland appeared to have ridden the mini storm and almost doubled their lead on 62 minutes, the impressive Gooch taking aim, his curler bursting through the hands of Stech but luckily for Town's stopper, he got enough to divert it over the bar. 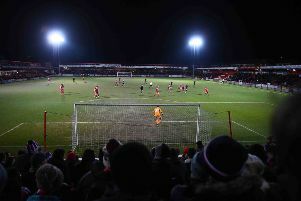 Town then had the leveller they had threatened on 67 minutes, as utilising the corner routine that was first started at Accrington, and served them so well last term, saw it pay dividends once more. This time, Sheehan and James Collins combined and the captain's dinked cross was won at the back post by Pearson, who steered the ball into the opposite corner for Luton's first goal of the League One campaign. They did have a major let off moments later, as after cursing the woodwork last week, were hailing t this time, Maguire turning and hammering against the bar from eight yards out. Town should have been in front with 15 minutes to go though, Stacey finding space and chipping the perfect cross for Hylton, but unmarked, he nodded badly wide of the target. Sub Lee Cattermole's glancing header wasn't far away for the Black Cats and at the death, Dan Potts connected well with Sheehan's delivery, but once again his radar was off, meaning the spoils were shared. Hatters: Marek Stech, Jack Stacey, Dan Potts, Alan Sheehan, Matty Pearson, Alan McCormack, Pelly-Ruddock Mpanzu, Jorge Grant (Harry Cornick 66), Elliot Lee (Jake Jervis 90), James Collins (Glen Rea 86), Danny Hylton. Subs not used: James Shea, Sonny Bradley, Andrew Shinnie, James Justin. Pompey: Jon McLaughlin, Adam Matthews, Bryan Oviedo, Glenn Loovens, Chris Maguire, George Honeyman (C), Lynden Gooch (Luke Molyneux 90), Jack Baldwin, Josh Maja (Luke O'Nien 86), Max Power, Bali Mumba (Lee Cattermole 54). Subs not used: Alim Ozturk, Robbin Ruiter, Elliot Embleton, Denver Hume. Booked: Matthews 19, McCormack 56, Grant 59, Baldwin 61, Loovens 90.